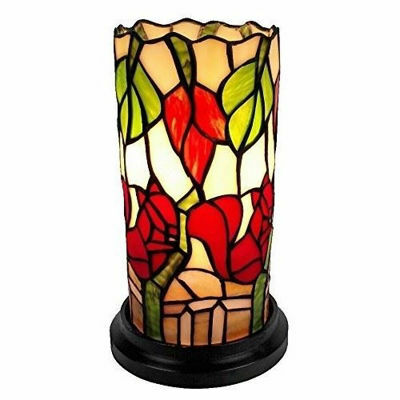 The glass lamp shade of this Tiffany-style table lamp features a simple pattern with red flowers that will glow when lit. The sleek, dark brown base will look elegant on your office desk or any other table throughout your home. Handcrafted using the same techniques that were developed by Louis Comfort Tiffany in the early 1900s, this beautiful Tiffany-style piece contains hand-cut pieces of stained glass, each wrapped in fine copper foil.